The Sauk Prairie Conservation Alliance and The Prairie Enthusiasts are co-hosting a day-long event on Saturday, August 29th at the Ruth Culver Community Library in Prairie du Sac. 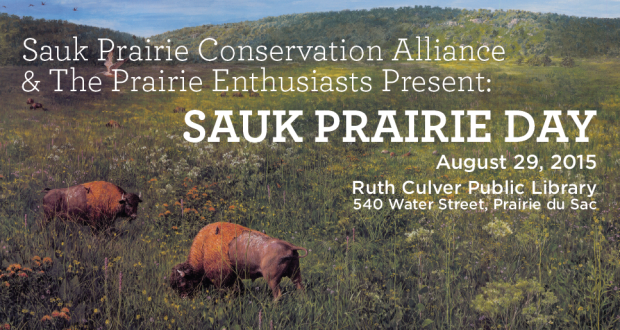 The morning (9:30am to 11:45am) will feature a series of short presentations on the origins of the Sauk Prairie and its ecology and cultural history. Presenters include: Ken Lange, retired naturalist, Devils Lake State Park and noted author; Dr. Alison Duff, ecologist and volunteer coordinator, Sauk Prairie Conservation Alliance; Dr. Curt Meine, Leopold biographer and environmental historian; and Randy Poelma, Ho Chunk Nation. During the lunch break (provided by the Alliance), a short video about prairies, “Prairie Enthusiasm,” will be shown. Beginning at 12:30pm, there will be a bus tour of three remnants of the original Sauk Prairie in the vicinity of Prairie du Sac, ending at lands recently acquired by the Ho Chunk Nation and the “Hillside Prairie” now owned by the Wisconsin Department of Natural Resources, both within the former Badger Army Plant. This event is free and open to the public. Young nature buffs are welcome and encouraged to join!